North-east campaigners joined others from across the UK yesterday in protesting the accelerated increase of the women’s retirement age. The demonstration outside the Houses of Parliament took place on International Women’s Day and as the chancellor unveiled his spring Budget. Organised by Women Against State Pension Inequality (Waspi), it aimed to highlight the impact of the changes to the state pension threshold on those born in the 1950s. Plans to bring women’s retirement age into line with men’s by 2020 – originally set out in 1995 -were fast-tracked in 2011. Campaigners are not against equalisation, but want fair transitional arrangements to be put in place to protect against hardship. They argue the women affected have been unfairly disadvantaged both by the speeding up of the process and lack of notice of the changes. Among those at the protest were Olive Sharpe and Georgia Skinner, who met SNP MP Eilidh Whiteford at Westminster. She said the UK Government should rethink the policy which “punishes one particular age group”. Labour Leader Jeremy Corbyn also condemned the “grave injustice” in a message of support. He said the decision to “move the goalposts” had been “plain wrong” and a “betrayal of tens of thousands of women”. Ms Skinner, 62, who currently works in IT at Aberdeenshire Council, became involved in the campaign two years ago. She said she was “devastated” when she found out, adding: “I want to be able to spend time doing things the way I had planned. 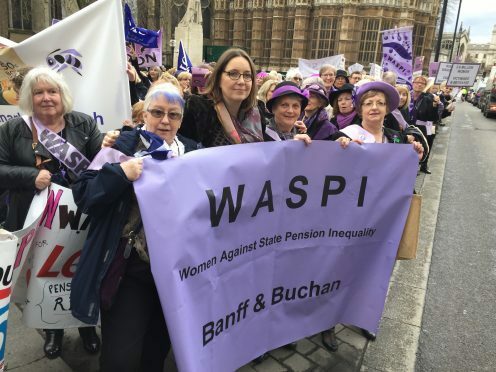 Ms Sharpe, 61, who set up the Banff and Buchan Waspi group, said a 2010 letter informed her she would be retiring in 10 years’ time rather than five. This was followed by further correspondence in 2012, which confirmed it would be an additional year on top of that. “We will continue to make our voices heard not just for 50s women but future generations,” she said. A Department for Work and Pensions spokesman said the equalisation process had been announced more than 20 years ago and corrected a “longstanding inequality”.